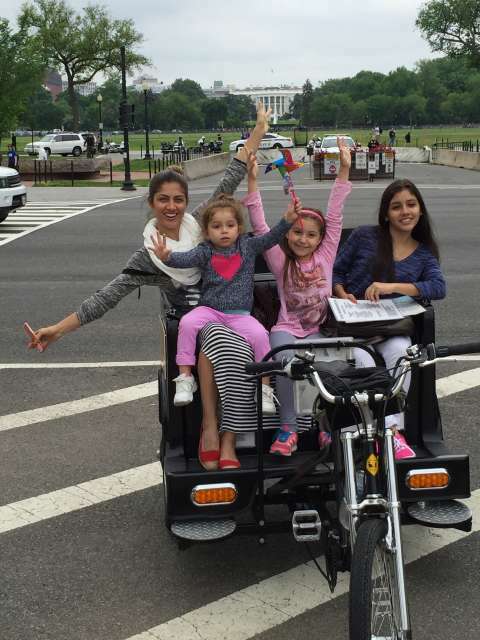 See the beautiful and awe-inspiring sights of Washington DC the best way possible. Why waste your time and money on a 'cookie-cutter' crowded group tour when you can have an memorable and affordable tailor-made experience? 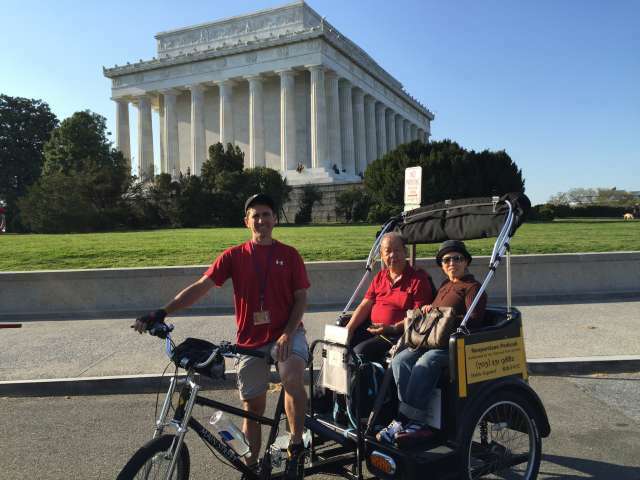 Professional and friendly guides from Nonpartisan Pedicab are experts on the National Mall and DC attractions. 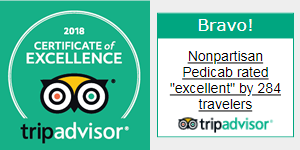 Our featured sightseeing itineraries are proven to be very popular and earn 5-star reviews on Tripadvisor, Yelp, Facebook and Google. Because quality and convenience are important, every private tour can be easily customized to YOUR specific needs and interests. 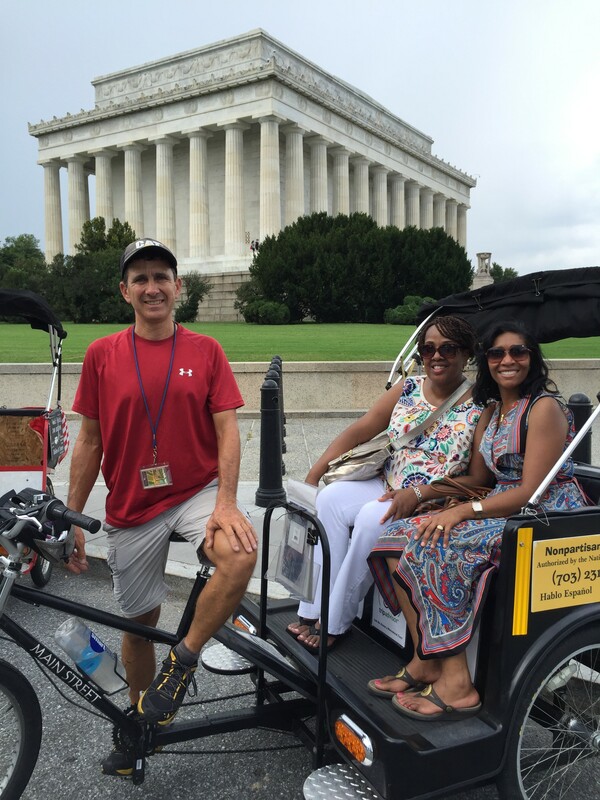 Call Robert for a recommendation on your ultimate tour: 703-231-9882. 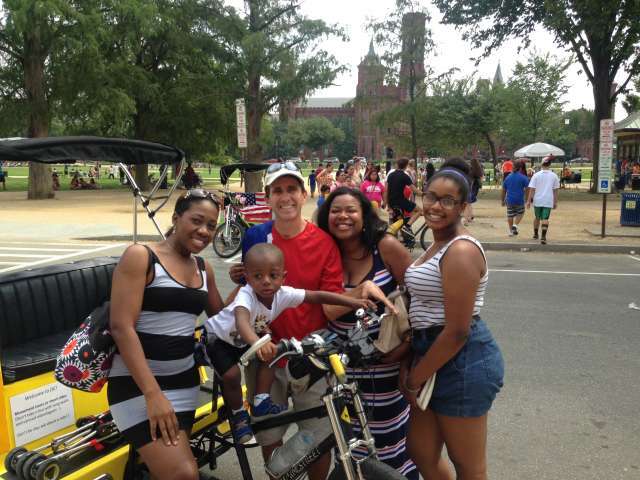 These guided Washington DC outings are Family Friendly, Pet Friendly, and Handicap Accessible. 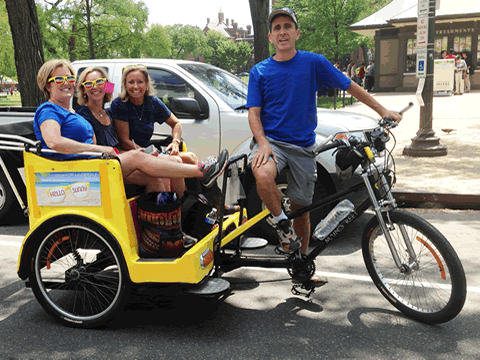 We accommodate individuals and large groups. 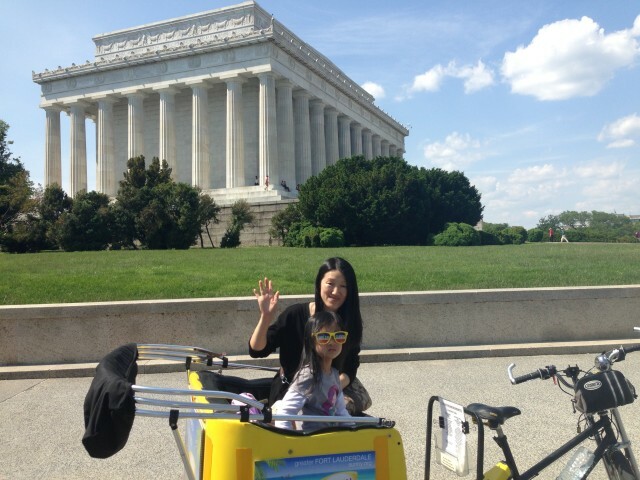 Please scroll or follow links for sightseeing tour details. 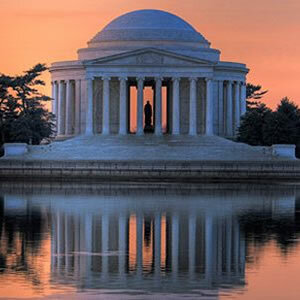 Visit at least 9 Must-See Memorials and Monuments! 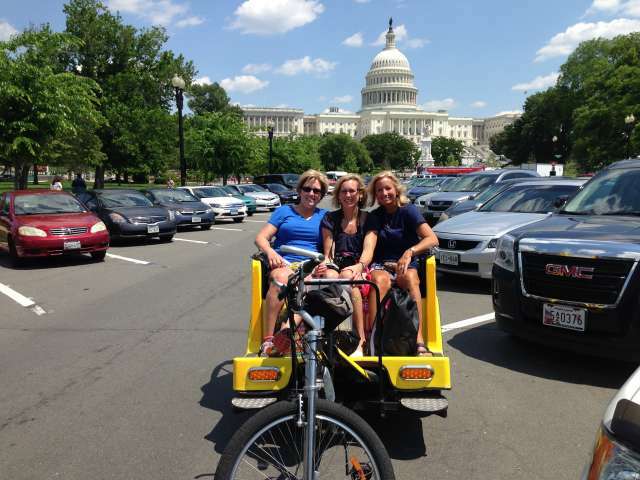 Private Tour Personalized to Fit Your Schedule! 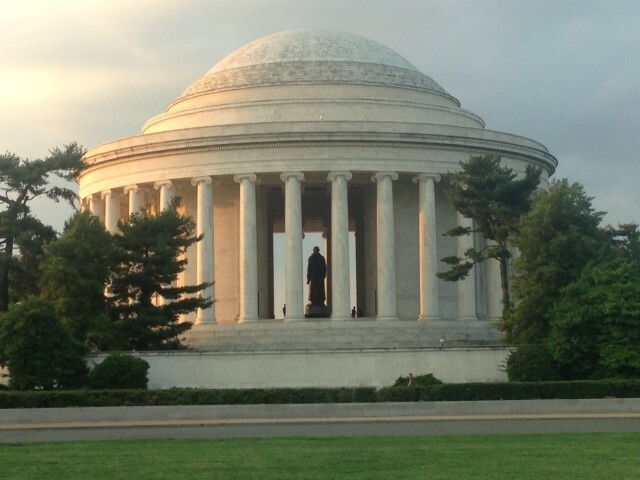 Spectacular Views of the Memorials at Twilight! 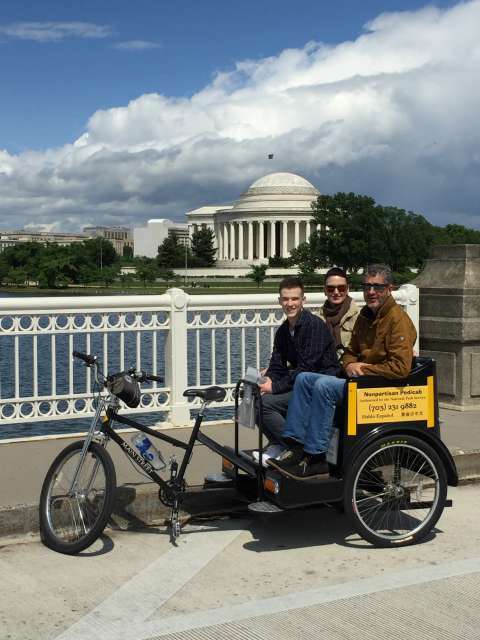 Includes White House, US Capitol, Washington Monument & More! 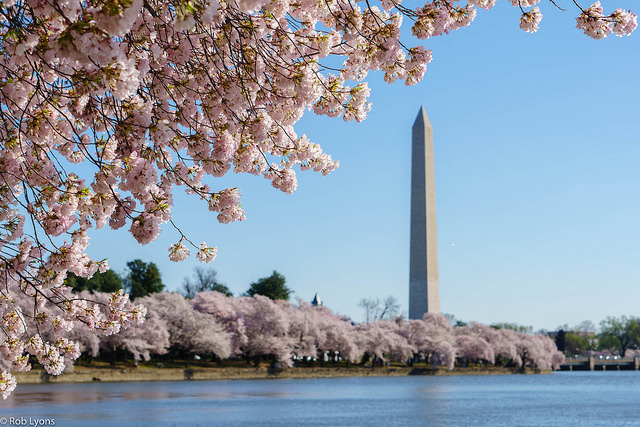 See the World Famous Cherry Blossoms around the Tidal Basin! Photo Safari of the Best Views! Comfortable Seating with a Shaded Canopy! You Always Have a 360º View! Free Pick-Up from Any Downtown Location! 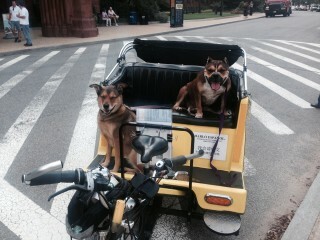 Strollers, Wheelchairs, and Pets welcome! Easy Access for Elderly and Handicapped Passengers! This is our most popular tour. 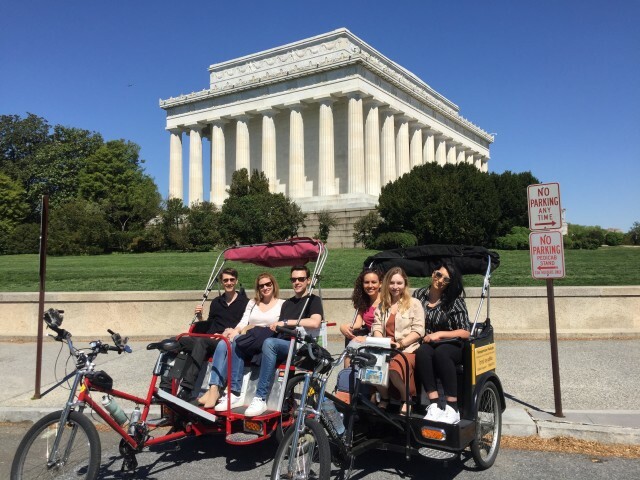 We consistently earn rave reviews, with many of our guests saying that this tour was the highlight of their visit to Washington. Your expert guide will meet you at any downtown location of your choice. 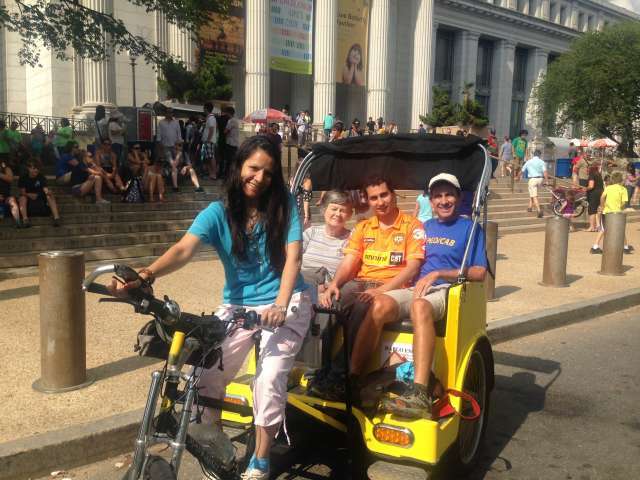 Each tour is personalized to start on your own schedule and go at your own pace. At each memorial, you will have an opportunity to go inside for photos or simply to explore. Every tour is just bursting with historical information and photo opportunities. 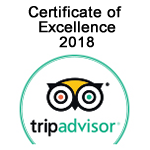 Most of our guests take 2 to 4 hours to see everything they want. 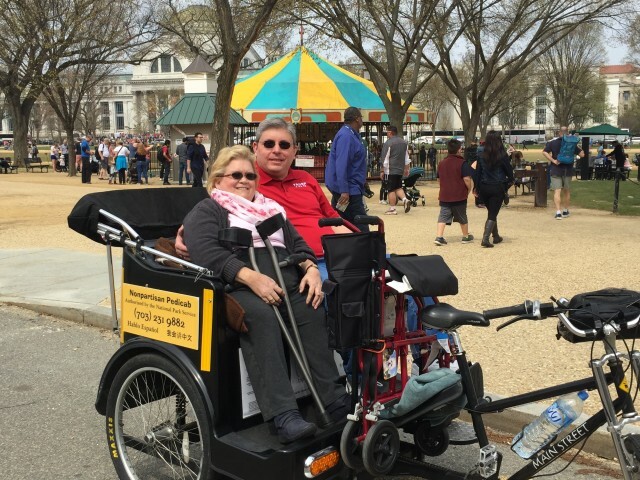 Sightseeing usually covers about 6 miles and 19 famous landmarks, but if you want to adjust and customize what you see, or the time you take, that's fine with us. 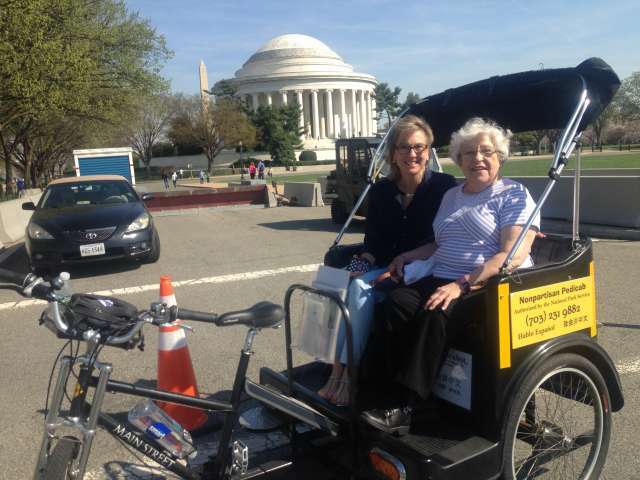 Our pedicabs are convenient and comfortable; we'll get you up close to the entrance of each memorial, so don't worry about long walks. Rates are hourly, starting from only $84 per hour. 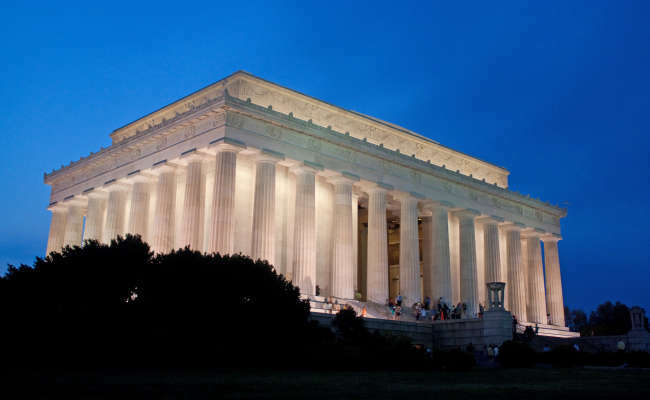 Day or night, a visit to the monuments is a spectacular and unforgettable experience. 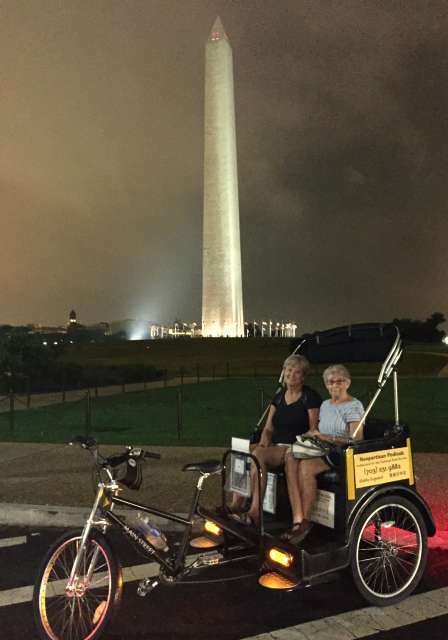 Our famous Twilight Tour of the Monuments is a spectacular and unforgettable experience. 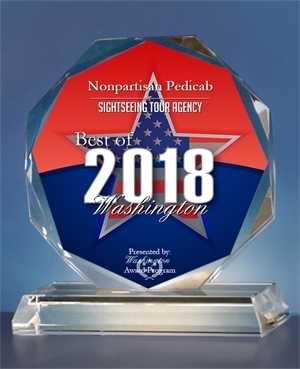 We consistently earn rave reviews, with many of our guests saying that this tour was the highlight of their visit to Washington. This is a private tour, so you will be interacting one-on-one with your personal tour guide at all times. The tour route follows that of our popular day time tour, and most of our guests take 2 to 3 hours to see everything they want. 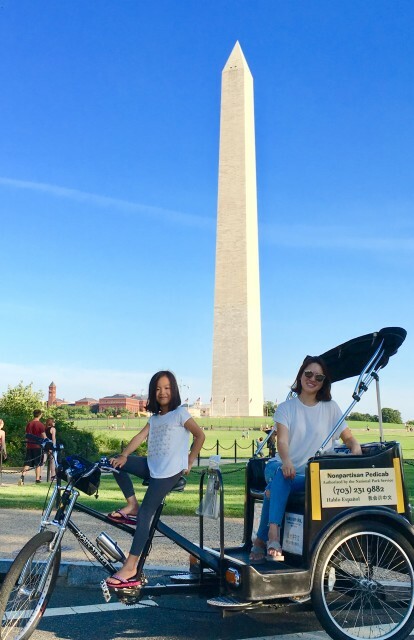 Sightseeing usually covers about 6 miles and 19 famous landmarks, but if you want to adjust and customize what you see, and the time you take, that's fine with us. Our cabs are convenient and comfortable; we'll get you up close to the entrance of each memorial, so don't worry about long walks. Rates are hourly, starting from only $84 per hour. 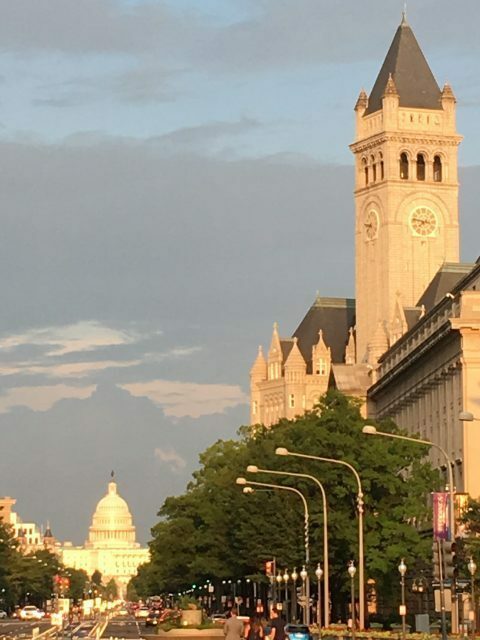 Pennsylvania Avenue is our nation's Main Street. 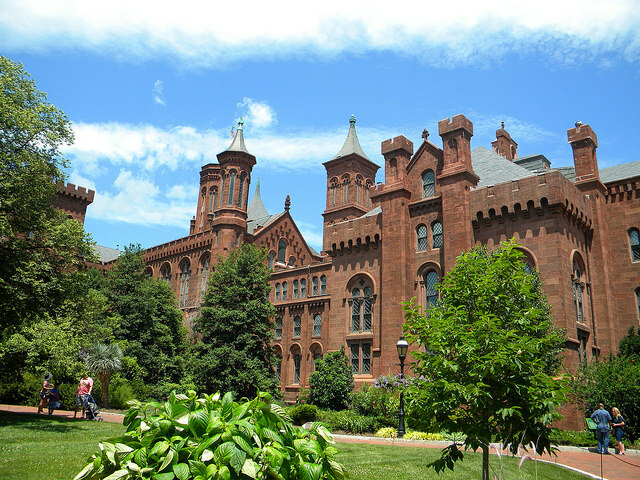 Every block is full of magnificent architecture and history. This tour is great for those who have already visited the memorials or who want to see the heart of the working city. 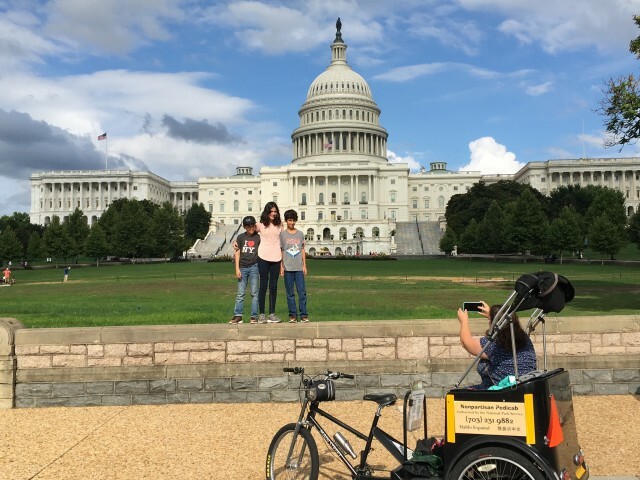 This tour can also be added on to the beginning or end of a DC Memorials Tour. 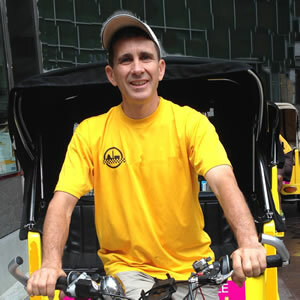 Your friendly and knowledgeable guide will meet you at the downtown location of your choice to begin your tour. 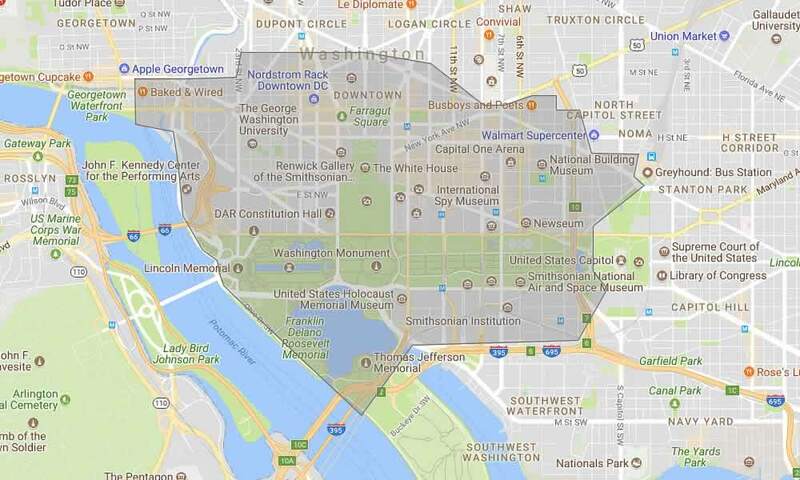 We follow the presidential inaugural route between the US Capitol and the White House, and we also cover the Smithsonian Museums and the Washington Monument. On this tour, we will also pass numerous impressive government buildings, where the day to day work of our government goes on. 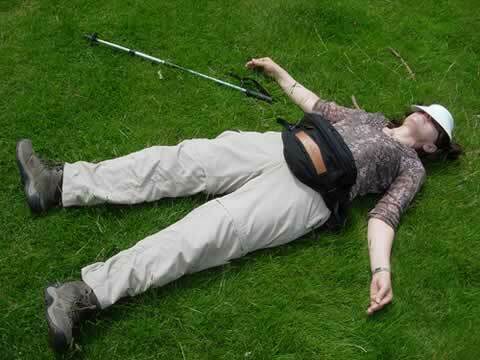 This tour generally takes 1½ - 2 hours. 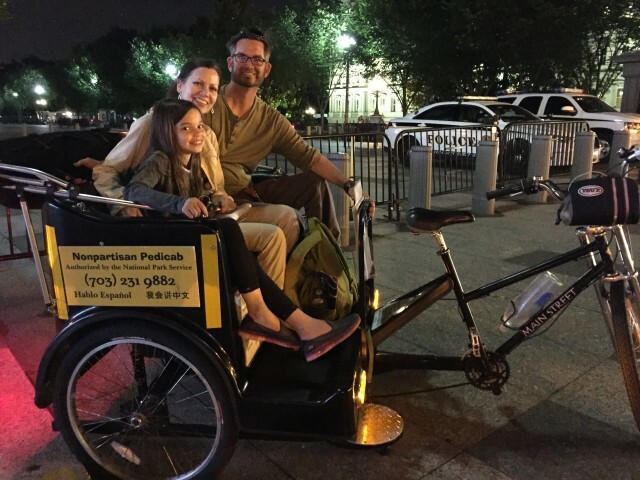 Sightseeing usually covers about 3 miles and 24 famous landmarks, but if you want to adjust and customize what you see, and the time you take, that's fine with us. 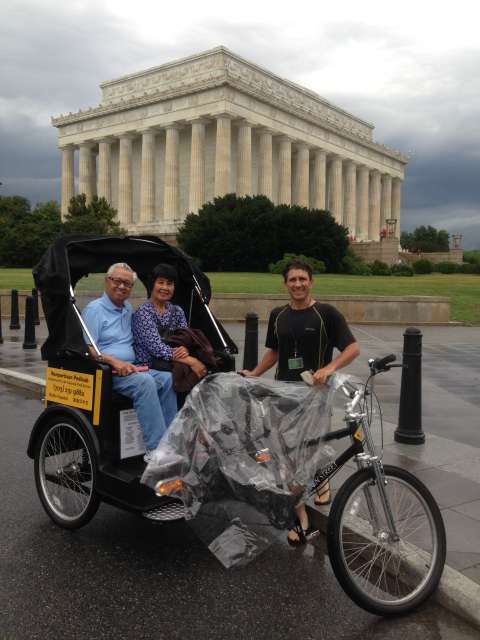 Our cabs are convenient and comfortable; not much walking is required on this tour. Rates are hourly, starting from only $84 per hour. 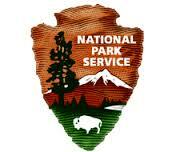 Have you visited all the monuments and seen all the museums? Feel like travelling the world? 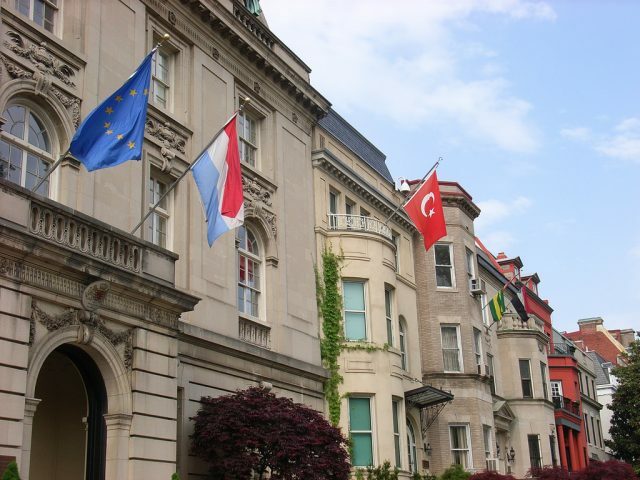 Embassy Row is in an exclusive residential neighborhood full of stately 19th Century mansions, statues of world leaders and cultural sites of interests. 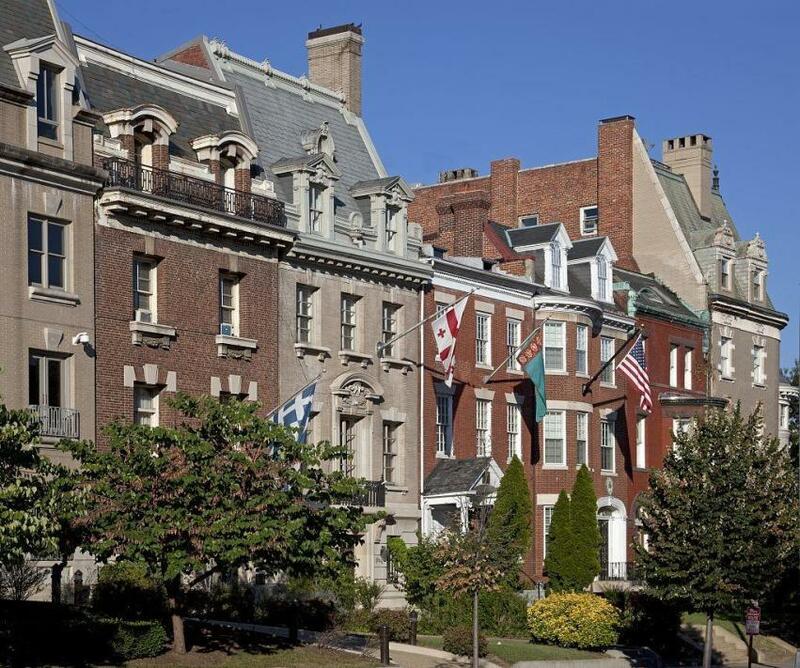 We can also take you through Georgetown, another exclusive residential neighborhood which is home to many famous people. 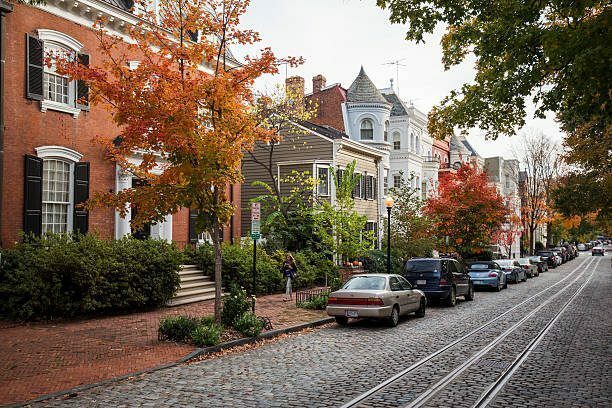 Quaint streets shaded by mighty trees, Georgetown University, the Exorcist Steps, JFK's home and the site where he proposed marriage to Jackie are all along our tour route. 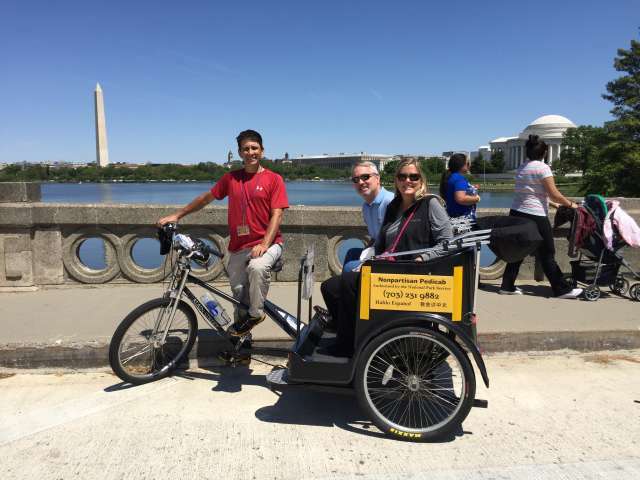 Your expert guide will meet you either at Dupont Circle or else from a downtown location of your choice to begin your tour. We have many excellent photo opportunities and plenty of world history to share. Most of our guests take 2 to 3 hours to see everything they want. 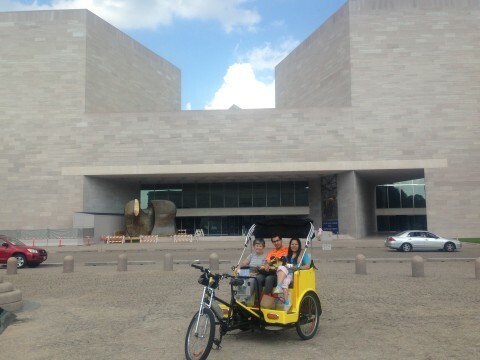 Not much walking is required to enjoy this tour. 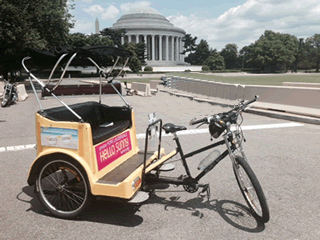 Most of the sites will be taken in from the comfort of your pedicab carriage. Rates are hourly, starting from only $84 per hour. 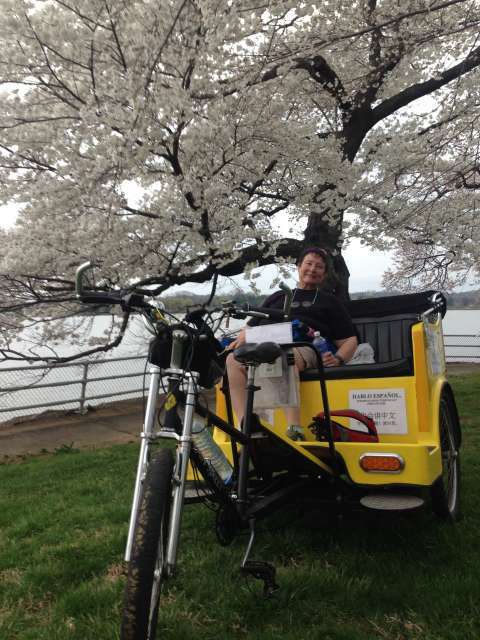 See the Cherry Blossoms and Tidal Basin! 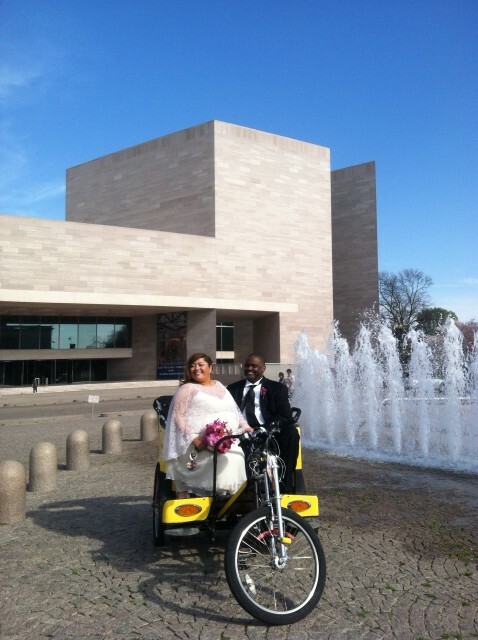 Visit the Jefferson, FDR, MLK Memorials! 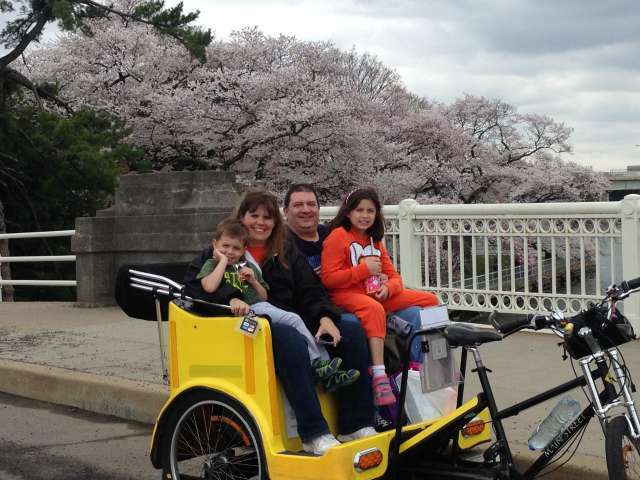 Breakthtaking views await as we set off on your personalized Cherry Blossom Tour around the Tidal Basin. 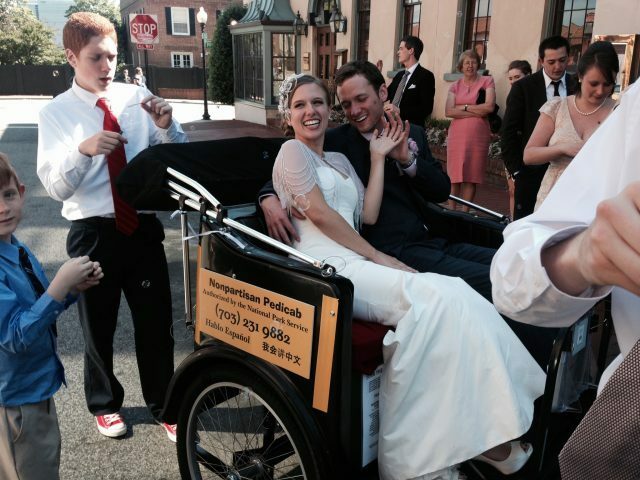 Your pedicab chauffeur will meet you at the downtown location of your choice, and off we go! History, architecture and awe-inspiring natural beauty combine to make this an unforgettable experience for visitors of all ages. Start on your own schedule. Go quickly or take your time. It is up to you. Additional FAQ Frequently Asked Questions can be found on our FAQ page.